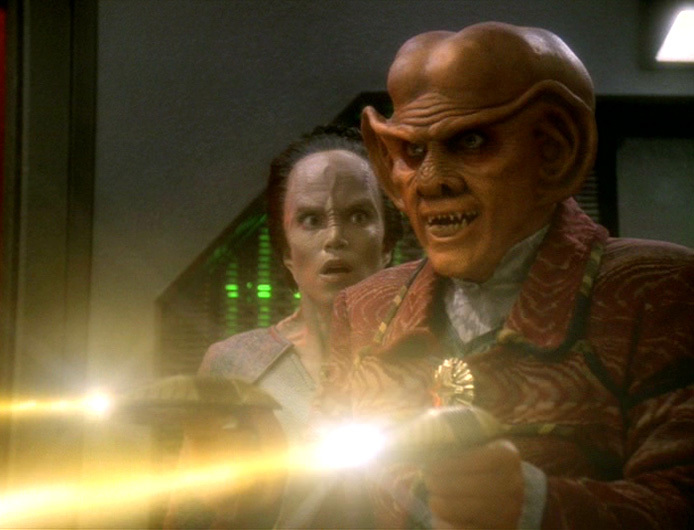 Part one: The Breen weapon from the previous episode is stumping the Federation and its allies. Klingon ships can be adjusted to compensate — meaning the Klingon fleet must take on the brunt of the combat duties. Gowron (Robert O’Reilly) shows up, gives Martok an award and then assumes command of military operations. Meanwhile, Sisko sends Kira, Odo and Garak to help Damar’s resistance effort. While they’re en route, Bashir discovers that Odo has the disease that’s infecting the rest of the Great Link. At Damar’s base, Kira’s group encounters resistance (see what I did there?) from the Cardies, but presses on. Back on the station, Bashir discovers that some medical records for Odo he received from Starfleet were faked, making him and O’Brien theorize that our old buddies at Section 31 were behind the cover-up — and likely the disease itself. Meanwhile, Odo displays the first signs of the disease. Part two: Gowron is taking big gambles with the Klingon fleet — apparently to bolster his own personal glory — and Sisko backs Worf’s plan (without asking for details) to fix the situation. Meanwhile, Kira and Co. continue to help Damar, eventually stealing a Jem’Hadar ship equipped with the Breen weapon, despite internal strife among Damar’s band and a deteriorating Odo. Martok refuses to challenge Gowron at Worf’s behest. Then, during a briefing with some nameless Klingons, Worf challenges Gowron’s plan to attack a well-defended Cardassian planet. The two start fighting, and Worf kills Gowron (!) and turns over control of the empire to Martok. Meanwhile, Bashir and O’Brien devise a plan to draw Section 31 to the station, by making them think that Bashir has figured out a cure to the disease. The advancement of Damar’s resistance cell and his development as a character are huge pieces. 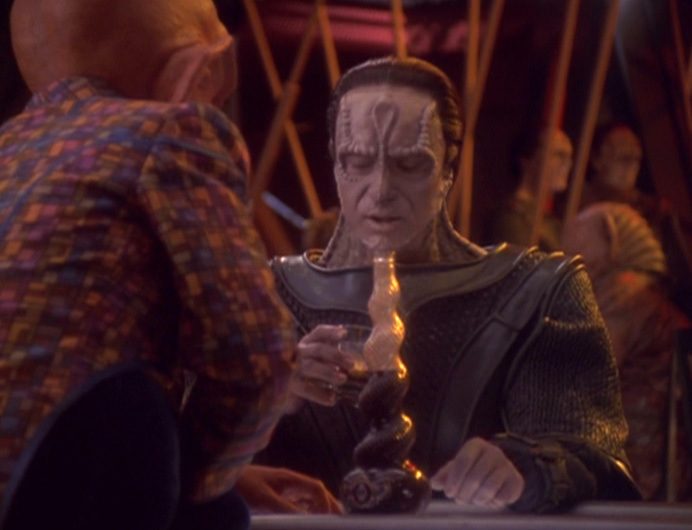 We’ll talk more about Damar below, though, as much of what happens with him is character-based. Now, Worf killing Gowron is one of the bolder and bigger moves in any Star Trek series. The two had been friends or enemies dating back nearly a decade and the transfer of power (as done in a way only a Klingon could love) was huge. That Sisko would tacitly endorse Worf’s plan to kill the head of state of an allied empire is pretty freaking amazing. I know the idea is that the Federation is desperate and that Sisko doesn’t really KNOW what Worf’s planning. But still. Damn, Gina. Some other developments in these two episodes — including the Dukat/Winn storyline from part one — are really inconsequential in the big picture, or, at most, incremental. But the Section 31 plan to commit genocide on the Founders is pretty freaking huge. There’s some goofiness with the plan and how Bashir and O’Brien figure it out, as we’ll discuss. Let’s talk about how Bashir learns Odo is infected. It all starts when he requests some medical records from when Odo was scanned during his trip to Earth in “Homefront”. Why wouldn’t Bashir — who’s had access to Odo for seven years — have his own scans? There have been times when Odo was really sick and Bashir was trying to help him. Wasn’t he scanning Odo while he was treating him? Speaking of which, why would the comparison scans matter? Remember that Odo was turned into a human as a punishment by the Founders back in “Broken Link” — a time Bashir was taking a TON of scans of Odo, BTW — and was left with virtually no Changeling stuff in his body. Then, in “The Begotten”, a dying baby Changeling merges with Odo, making Odo a Changeling again. In other words, would the scans taken before Odo lost his shapeshifting abilities be at all helpful? I know there’s the whole bit about “the drop and the ocean” or whatever when it comes to Changelings and the Great Link, but it doesn’t sound like Bashir wanted to study Changelings. He wants to study Odo specifically. And, if so, the scans from “Homefront” should be of no help to him. Last thought on this point. 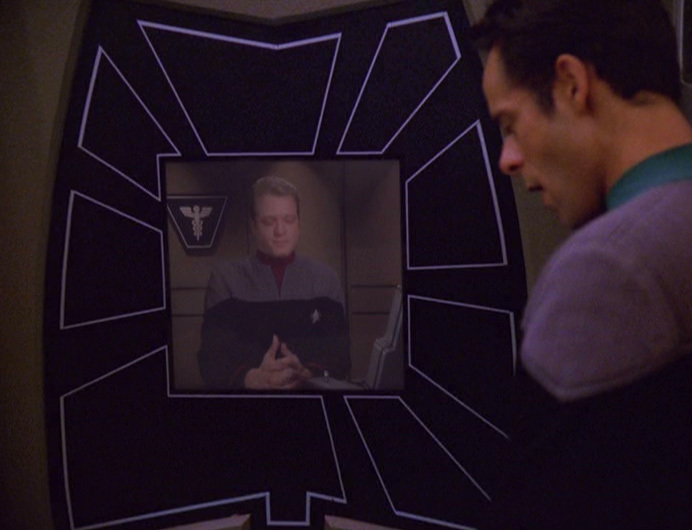 It’s a little convenient that Bashir and O’Brien are so accurate in guessing that Section 31 was behind the disease. Their supposition certainly makes sense, but they operate on no real proof. What if, after all their sleuthing, someone else had been behind the disease? Meanwhile, there are a lot of weird little things in these two episodes. — Kira’s education of Damar’s dudes seems extremely basic, considering that most of the Cardassians should have known how a resistance works based on the recent war with the Bajorans. Shouldn’t they have known how autonomous cells operate and why? — Speaking of Damar’s resistance, does it seem strange to anyone else that he, Kira, Odo, Garak and Rosot (John Vickery) all go on the mission to steal the Jem’Hadar ship? That would be like George Washington taking his four top advisers to steal a British naval vessel. It’s more likely that some underlings would have been assigned to do it. We’ve talked about this issue before with DS9, though. — Martok mentions, early in part one, that 1,500 Klingon ships will start raiding Dominion targets, and it’s then said that they’ll be outnumbered 20 to 1. Considering that no reinforcements have come from the Gamma Quadrant — and that the loss of 2,800 Dominion ships in “Sacrifice of Angels” was a big deal — how do the Dominion and the Breen have 30,000 ships? If the Breen, on their own are so formidable, why haven’t they done something on their own, previously? No, this is another example of DS9’s creators amping up the stakes unnecessarily. Why not simply say 10 to 1, or even 5 to 1? 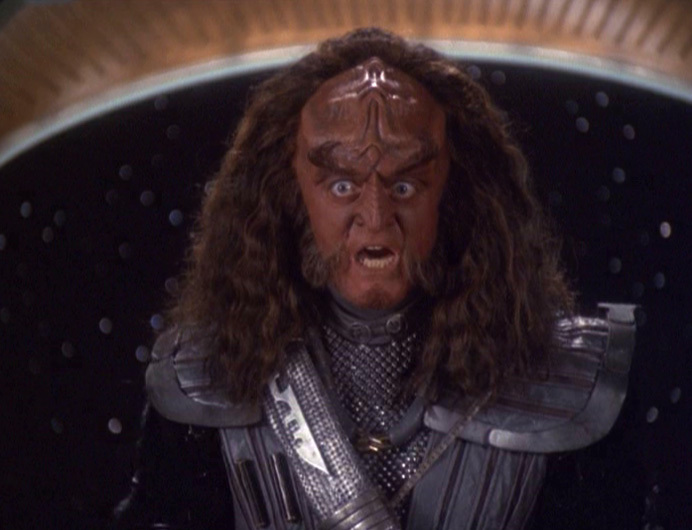 — Gowron is too stupid for words in these two episodes. It’s a shame, because the end result is interesting — but making Gowron look like a total moron wasn’t necessary. The Dukat/Winn stuff, in which Dukat goes blind because he reads the forbidden Bajoran texts, was just filler. The Damar/Kira story is probably the strongest of the arc at this point, even if it’s more character-centric, as Damar is making huge leaps as a character. His decision to kill Rosot (in a great scene on the captured Jem’Hadar ship) was a huge indicator of where he believes he needs to take Cardassia. Kira calling Damar out about killing innocents in an earlier scene was wonderful — and Garak telling Kira that she was right to say it was a brilliant decision by the creators. For all three characters, we see just how far they’ve come. 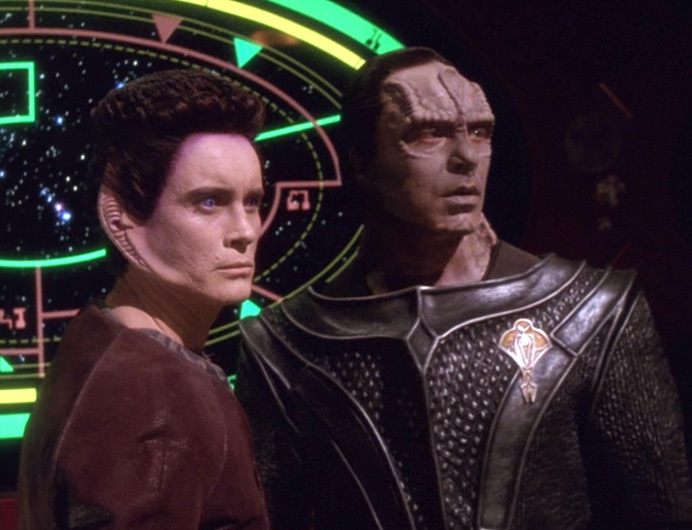 One of the strangest episodes of DS9, as Bashir and O’Brien have their last buddy episode — INSIDE SOMEONE’S MIND? Part one: Sisko’s back on Earth at his father’s restaurant, still searching for answers after Jadzia’s death and the departure of the Prophets. Meanwhile, the war continues and Kira grants permission for the Romulans to set up a hospital facility on one of Bajor’s moons — only to find the Romulans are putting weapons there. 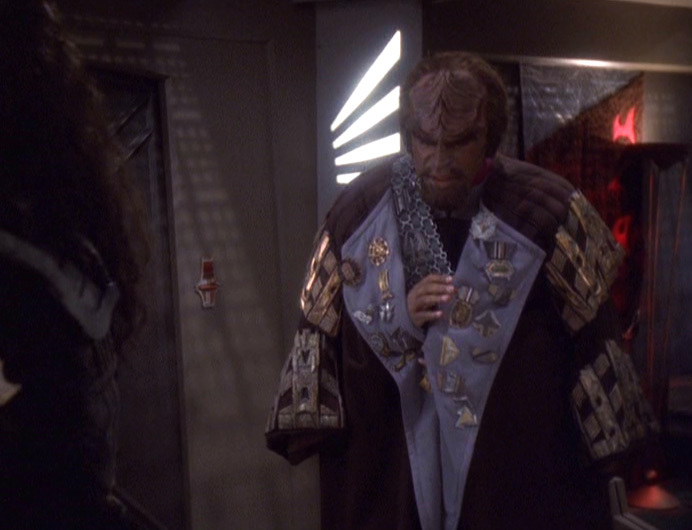 Worf is still hurting from the loss of Jadzia, mostly because she didn’t get a warrior’s death. After O’Brien (in a great scene) gets to the bottom of Worf’s problems, Martok steps in, asking Worf to be his first officer on a dangerous mission to honor Jadzia. 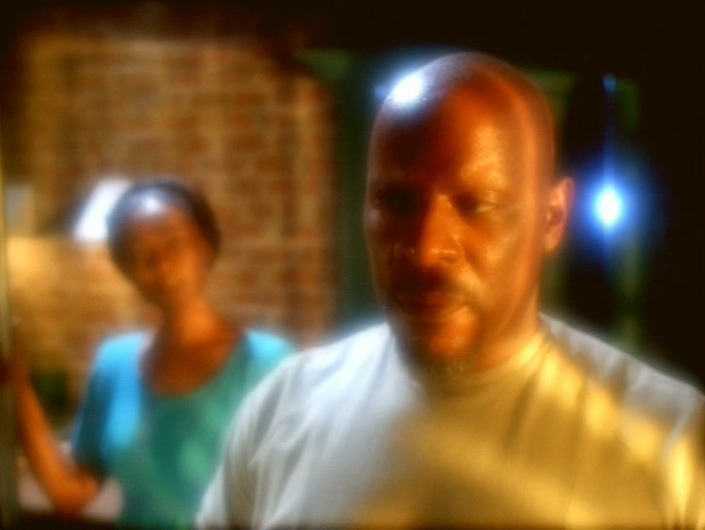 Back on Earth, Sisko finally has a vision and sees a woman’s face in the sand. It turns out the face belongs to the first wife of his father Joe (Brock Peters) and the woman is actually Sisko’s mother, whom Sisko had no knowledge of and who left Joe and died while Sisko was a small child. 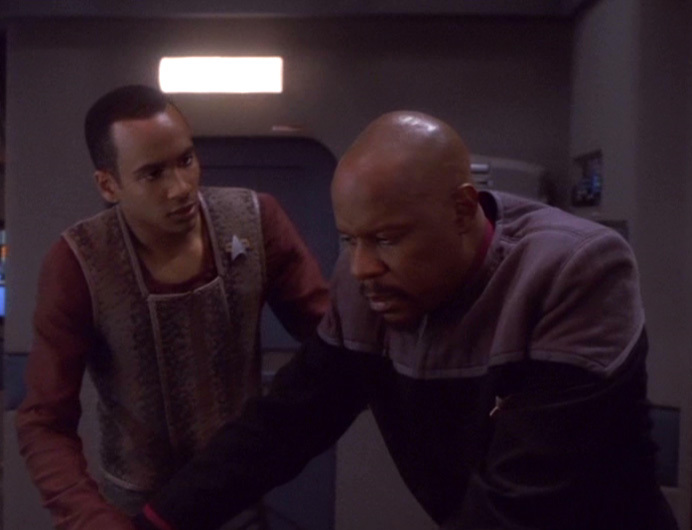 Sisko decides to go look for the woman and the Orb of the Emissary, mentioned in the vision, on the planet Tyree, and preps to leave with Jake and Joe. As the episode ends, a young woman arrives at the restaurant, identifying herself as Ezri Dax (Nicole de Boer). Part two: We learn that Ezri was unprepared to take on the symbiont, so she’s having a tough time adapting to being joined. But she leaves with the Siskos for Tyree. Kira, meanwhile, sets up a blockade to prevent the final pieces of the Romulans’ weapons from reaching their base, with Admiral Ross stuck between Kira and Romulan Senator Creetak (Megan Cole). Worf and Martok head out for their mission to destroy a Dominion shipyard with O’Brien, Bashir and Quark along. 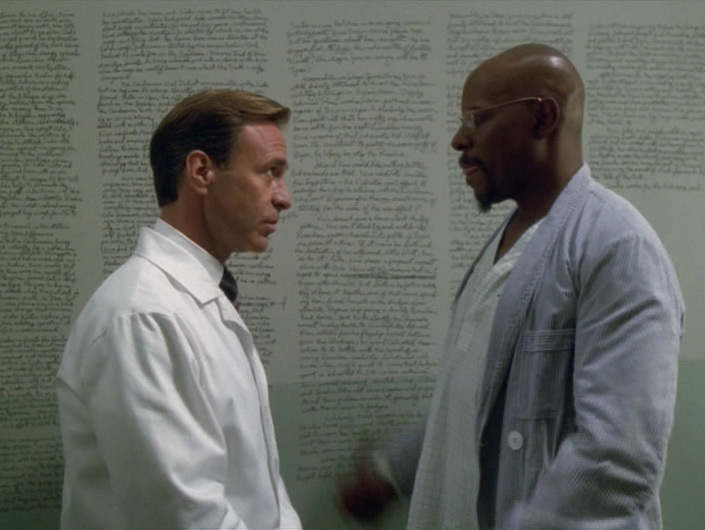 The three plots coalesce as Sisko finds the Orb of the Emissary but becomes Benny Russell (“Far Beyond the Stars”) in a mental hospital being told his stories of DS9 aren’t real. Just as Sisko/Russell is about to accept this — and as all looks lost for both Kira’s blockade and Worf/Martok’s mission — Sisko/Russell does a 180 and opens the Orb box instead of smashing it. The wormhole reappears, and an emboldened Kira says she won’t back down, despite the presence of several Romulan warbirds — prompting Ross to step in and force the Romulans out. Martok’s ship successfully destroys the Dominion shipyard and Sisko speaks with the woman who was his mother, Sarah (Deborah Lacey). She is a Prophet who briefly merged with a human woman to … orchestrate Sisko’s birth. Sisko heads back to DS9 a hero, and the staff — included a befuddled Worf — meets the new Dax. Well, we learn that Sisko is part Bajoran god, so that’s something. As noted in previous reviews, the DS9 creators really decided to go for broke in the final season-plus. Here’s another example. The continuation of the Federation/Romulan alliance also is important, though it’s annoying that we see no fallout after this episode — and we later see Creetak as rather buddy-buddy with the DS9 crew, including Kira (hmmm). Meanwhile, we don’t really see how the destruction of the shipyard plays in, but I suppose it can be inferred that it further weakened the Dominion. In one way, these two episodes are tough to critique based on our usual criteria. We learn that Sisko is — and always has been — at least partly a descendant of the Prophets, meaning that he was always meant to come to DS9, discover the wormhole, etc. But way back in “Emissary”, the Prophets were all confused about what a linear being even was and certainly didn’t recognize Sisko. Granted, that wouldn’t do much for exposition in the pilot. But it would have tracked better with aliens who have no concept of a linear existence. Oh, and does anybody else think it’s weird that Sisko could take a leave of absence and just borrow a runabout? Wouldn’t this be like a captain in the U.S. navy borrowing a fighter jet to go home for vacation? Granted, we’ve seen DS9 officers take runabouts on vacation before, but not for three months. Also, where is Tyree? Is it in the Bajoran system? Is it just some random world Sisko knew about and recognized in his vision? Like the runabout question, it’s not a huge deal. But both are sort of odd. Final question, with all of our heroes off the station in the second episode, who was in command of DS9? Ross is there, of course, but he was clearly dealing with Kira and Creetak. The only quasi-main character with any sort of rank whom we don’t see in part two is Nog … so I guess he was treating the Ops staff to some root beers? Ambiguity surrounding the Prophets aside, I love these two episodes, particularly part two. The cross-cutting between the three plots really works, and that things get better for Worf and Kira as Sisko decides to open the Orb box was well done — and the visuals with Martok’s ship are some of my favorite in the series. And though I’ve never been a huge fan of “Far Beyond the Stars” — Avery Brooks’ performance was over the top and most of the other characters played by the regular cast were really annoying — I’ll give the creators credit for calling back to that episode here. There’s also, of course, the introduction of a major character in Ezri Dax. While the creators rammed a lot of “Ezri Fun!” down our throats in the seventh season — “Prodigal Daughter” and “Field of Fire” almost seem like they were required by de Boer’s agent for her to join the cast — she mostly works in the season’s first two episodes. The scene in the runabout in part two just after she’s been space sick was a bit much, but it actually gave Cirroc Lofton something to do, which doesn’t happen much in the seventh season. 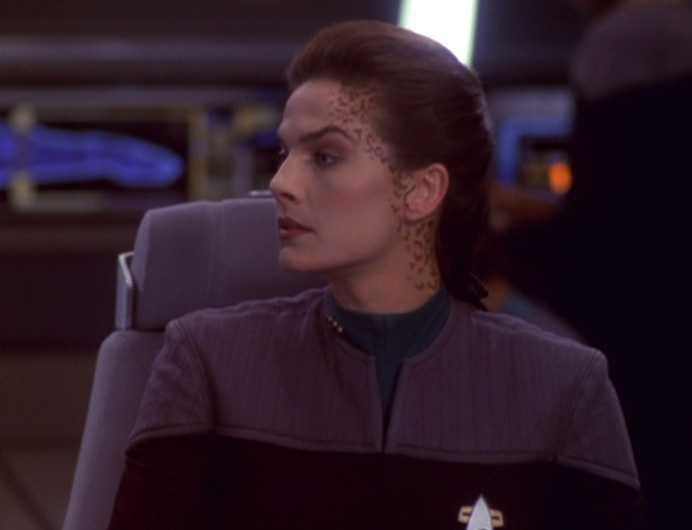 De Boer seems to have studied Terry Farrell’s performance, which was a nice touch. But season seven’s slight drop in quality can be traced in part to too much Ezri. Finally, the scene in which O’Brien brings a bottle of blood wine to Worf’s quarters to find out what’s bothering our favorite Klingon really shows how good the DS9 actors were in their roles. For Michael Dorn and Colm Meaney — who had been playing these characters for more than a decade — the ease of the conversation was just so great. “You call that a visit? !” “I enjoyed it.” Perfect. Oh, and gotta love any mention of our old buddy Reg Barclay from TNG. “Who could forget him?” Worf says, hilariously. Nog does his best Corporal Klinger impersonation. Oh, and the Founders are dying, or something. Sisko is tasked by Starfleet with planning a new offensive against the Dominion. As Damar and Weyoun ready for the attack in their closet/headquarters on Cardassia Prime, Dukat shows up, telling them that he can use a captured Bajoran artifact to enlist the Bajorans’ pah-wraiths (introduced back in “The Assignment”) and destroy Sisko in the process. Sisko readies to attack a planet in Cardassian space and is contacted by the Prophets, who tell him not to leave. Sisko, of course, chooses his duty over the Prophets’ warnings. The battle is a success, but a possessed Dukat shows up on the station as it’s happening and deposits a bunch of evil energy — I’m not really sure how else to describe it — into one of the Bajoran Orbs, killing Jadzia in the process. Sisko returns to the station with the wormhole gone and Jadzia dead (though the Dax symbiont is saved and sent to Trill). As the episode ends, a saddened and somewhat lost Sisko is back at his father’s restaurant on Earth, searching for answers. This is another episode in the Dukat random-element series. It also connects him with the pah-wraiths, which is an important relationship through the end of the series, as we’ll see. The Federation and its allies going on the offensive is big, too. The tide of the war was clearly turning at this point. And then there’s Sisko and his slow and steady march toward a stronger connection with the Prophets. That will come to fruition more in the next few episodes, but it’s shown here. The Prophets clearly are watching and mindful of everything Sisko does — which is a (believable) departure from what we saw way back in “Emissary”. First of all, it’s weird — and clearly contrived — that Dax was left behind in command of the station. The more natural and common thing would have been to have Kira on DS9 and Dax on the Defiant with Sisko. But then, Dax wouldn’t be on the station when Dukat arrived and wouldn’t be caught in the crossfire. Also, I find it hard to believe that Sisko would allow Garak on the Defiant’s bridge after “In the Pale Moonlight”. Oh, and this is as good as time as any to bring this up. Dukat beams aboard the station (from parts unknown) because Dominion transporters can operate over extremely large distances (we learn it’s like three light years in a few episodes). So, why wouldn’t the Dominion get three light years away and just beam hundreds of Jem’Hadar on board the station? Sisko’s talk with Dax’s coffin is a high point of the episode, but so is the initial discussion with Damar, Weyoun and Dukat. One of DS9’s strengths was the great supporting cast who played truly well-developed characters. Jeffrey Combs, Marc Alaimo and Casey Biggs just hit it out of the park in this episode, and Alaimo’s delivery about Dukat being a “new man” was pitch perfect. Oh, and I don’t care for Vic Fontaine so I won’t write about him much. Sorry! New Dax, same as the old Dax. Except shorter. Sisko’s fleet begins fighting the vastly larger Dominion force while Dukat watches with glee and prepares to take down the minefield around the wormhole. 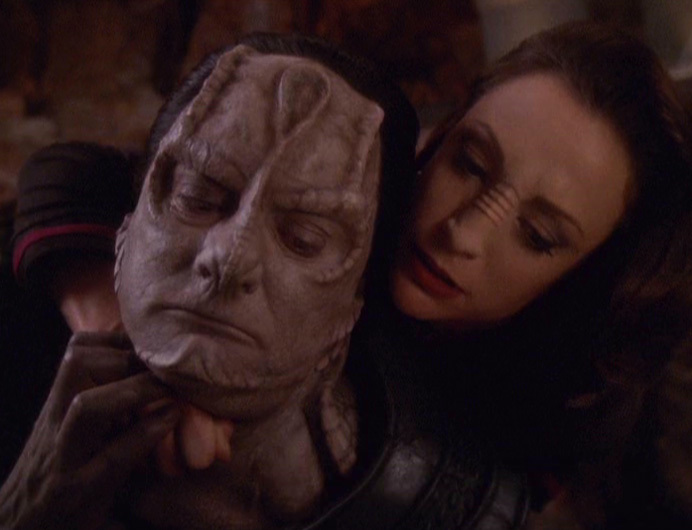 At Damar’s suggestion, Kira, Jake and Leeta are all taken into custody (where Rom was being held pre-execution), leaving Quark as the only member of Kira’s resistance cell able to do anything. Quark, getting an assist from Ziyal, frees Kira’s team, and Kira and Rom work to disable the station so it can’t remove the minefield. The Defiant eventually breaks through the Dominion lines — with some late help from Worf and the Klingons — and sets course for the station. Odo picks his side and helps Kira and Rom, but Rom is just a second to late — and cuts the station’s weapons after the minefield has been destroyed. The Defiant arrives just in time to watch the mines explode and Sisko sets course into the wormhole, where the ship runs into the huge Dominion fleet. Then, the Prophets summon Sisko, asking him if he’s trying to die. Sisko talks the Prophets into intervening — “If you want to be gods, BE gods” — which they do, after telling Sisko there will be a penance. 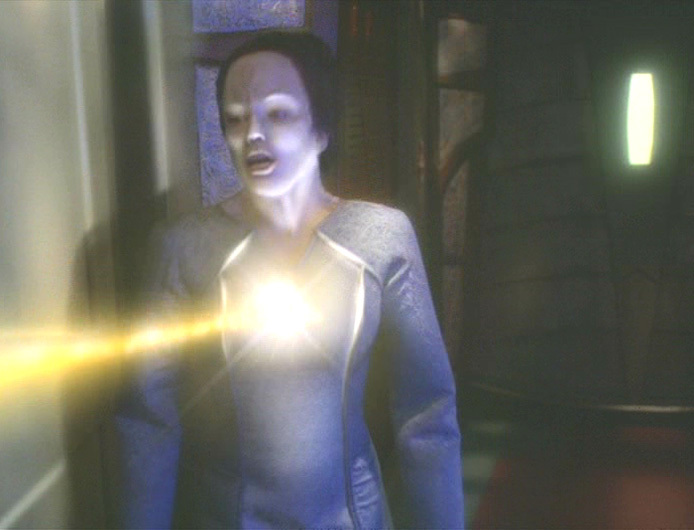 The Dominion ships disappear, and the Defiant comes out of the wormhole, firing on a disabled DS9. 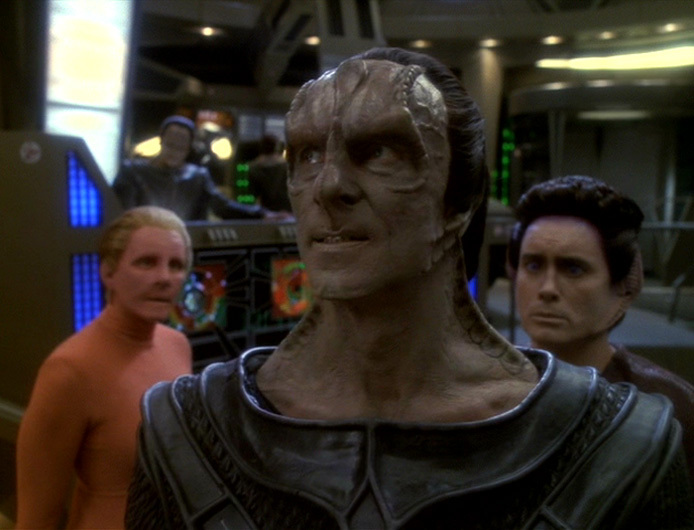 Weyoun orders evacuation and a retreat to Cardassian space and a stunned Dukat starts to fall apart. He finds Ziyal, who admits to helping Kira, and just as Dukat has apparently forgiven her, Damar shows up and shoots and kills Ziyal. After the Dominion evacuations, Sisko and company retake the station and find Dukat, a broken man from the ordeal. Dukat’s breakdown and subsequent actions, which we’ll get into in future reviews, really change the math for the rest of DS9. Instead of merely fighting the Dominion, Sisko must face a random element in Dukat who decides to take on the Bajorans, Sisko and the Prophets because of their actions there. Before I get started, let me be on record as saying I really like this episode, despite what may come across as ranting. As the episode begins, occupied DS9 has at least a handful of Dominion and Cardassian ships in the area. There’s no discussion of these ships being sent to help with the fighting. And yet, they seem to magically disappear after Rom disables the station’s weapons. This is very important, in that the Dominion gives up the station (too easily) when the Defiant emerges from the wormhole. If even one of those ships was still around, it could have at least tried to take on the Defiant. I know that subsequent dialog establishes that the Starfleet/Klingon ships were on their way to the station after breaking through the Dominion lines. But if the Dominion had kept even a ship or two at DS9, they might have been able to hold off the Defiant until the station’s weapons were fixed so they could hold off the Starfleet and Klingon attackers. And, BTW, we KNOW that some Dominion ships were still at the station, as the Dominion used them to evacuate its personnel. The creators somewhat weakly sidestep this by not showing the evacuation ships, meaning that maybe they were just shuttles or something that would have been unable to stop the Defiant. But that’s really weak sauce, as it would suggest that the Jem’Hadar and the Vorta would be cool putting a Founder in a small (and presumably lightly armed) ship in the middle of a war zone (among a host of other reasons). 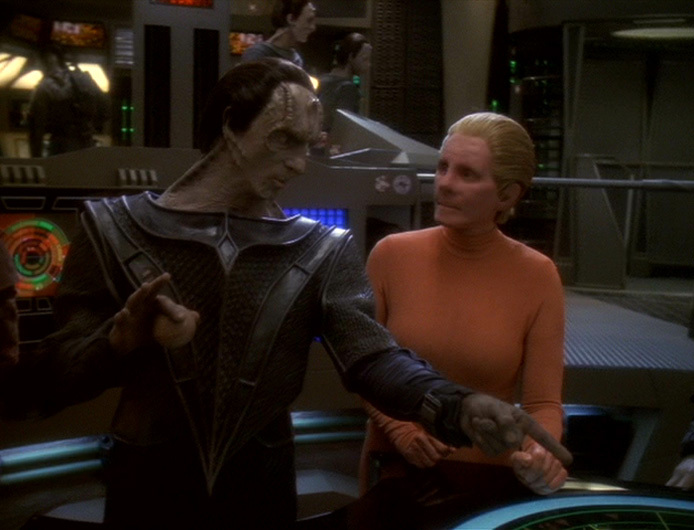 And, frankly, Weyoun and the female Changeling are just WAY too chill about losing the station. Keep in mind that a season-plus later, we learn just how much the Dominion doesn’t like to lose. As long as the complaint fest is going on, let’s address the fact that the Defiant still has the cloaking device on loan from the Romulans — despite the fact that the Romulans (at this point) have a non-aggression pact with the Dominion. The cloaking device is disabled during the battle early in the episode, but it is mentioned. Shouldn’t the Romulans have gotten that back when the war started? While this is a criticism that might be best addressed after this episode, it makes sense to mention here: Why wouldn’t the Dominion take action against some weird wormhole aliens who just (apparently) destroyed 2,800 of their ships? After this episode, Dukat is the only one who seems to grasp the Prophets as a threat and a potential enemy. That’s really unlike the Dominion, who take every opportunity to strike out at perceived foes. We learn after this episode — too late, really, as the question is left unaddressed until the end of the season — that the Prophets will begin keeping ships from using the wormhole, preventing reinforcements from the Gamma Quadrant. That’s another reason the Dominion likely should have been looking for ways to attack the Prophets. Of course, I could quibble with the deus ex machina allowing Sisko to get rid of 2,800 Dominion ships. Watching this in 1997, I felt the ending was a cheat. But I’ll give the DS9 creators credit for how they incorporated the penance later — and how they use this as a springboard to make the Prophets more active participants. Put another way, it was a cheat — but it was a well-done cheat after the creators (in true DS9 style) stacked the deck too highly against themselves and our heroes. Lastly, I really love that Quark kind of saves the Alpha Quadrant here. We see just how badly this all messed up Dukat. Sisko begins plans to retake DS9 as things go from bad to worse on the station. Kira does all she can to save Rom, but Dukat and the Dominion are set on executing the Ferengi engineering genius. Sisko, meanwhile, gets buy-in from Starfleet to try to retake the station on the premise that the wormhole is the “key to the Alpha Quadrant”. He begins massing a big fleet — without Klingon assistance, as Gowron needs more convincing to participate. Then, Sisko gets a message from Kira and Jake — sent through Morn — telling him of the Dominion’s plan to take down the minefield and bring 2,800 ships into the Alpha Quadrant. 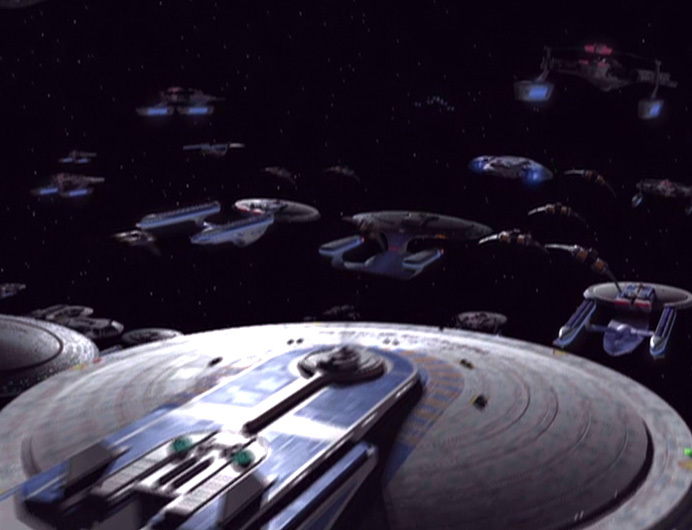 Sisko leaves with 600 or so ships he has and ends the episode facing a Dominion fleet twice the size. Like our last review, the summary covers a lot of why the episode is important. This sets in motion one of the biggest battles of the Dominion War. Not mentioned in the review is the return to form by Odo — or, at least, the beginning of the return to form. After he seemed lost to the Great Link forever in “Behind the Lines”, his loyalties seem more conflicted here. And that’s a big deal going into the next episode and the rest of the series. There’s the awful speech by Dax to Sisko at the beginning of the episode that basically insinuates that Sisko is a desk jockey who doesn’t understand what’s going on amid the fighting. 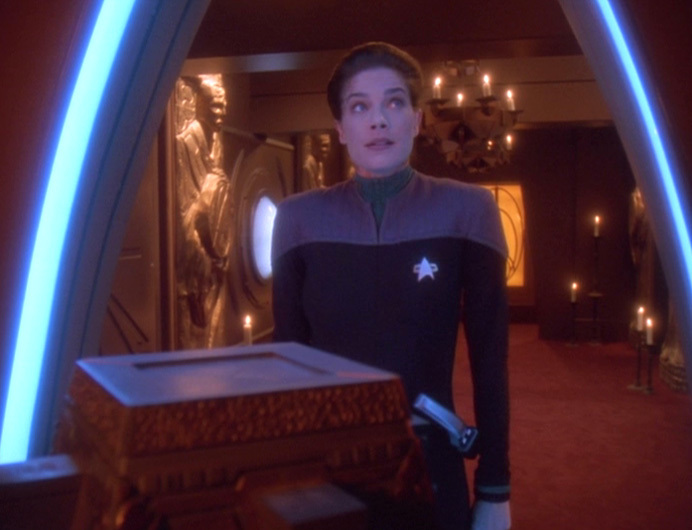 Considering that Sisko was IN the fighting the previous week, the scene was just horribly written (not to mention poorly acted by Terry Farrell, who really seems like she had one foot out the door at this point). There’s also the sloppy business with Worf and Martok going to the Klingon homeworld to convince Gowron to send ships to help Sisko’s task force. While I can get behind the idea of sending a friend and an enemy to talk to Gowron, it’s too hard to swallow that Starbase 375 (where Sisko was posted), the Klingon homeworld and DS9 are so close that Worf and Martok could get to Gowron quickly enough and return quickly enough to help in the fighting. Remember that the timing of the attack had to be moved up, thanks to Morn’s message. The Klingon piece, really, just side-stepped something I’m guessing the creators didn’t want to handle: Why not send a cloaked fleet of Klingon ships to DS9, decloak near the station and try to take it back over? And, the biggest problem: If Sisko and Starfleet are in agreement that the wormhole is the “key to the Alpha Quadrant” why did they give it up with relatively little effort back in “Call to Arms”? Remember, Starfleet committed resources elsewhere leaving just the station, the Defiant and Martok’s ship as a defense. Even if most resources HAD to be committed elsewhere, couldn’t Starfleet have risked another 20 ships or so — in hopes of maintaining control of the wormhole and successfully completing the other mission? While this episode works in a lot of ways, it’s a great example of one of DS9’s biggest flaws: The creators would bite off so much as far as problems facing our heroes in efforts to increase the drama that the ultimate solution would be somewhat unbelievable and almost stupid. We’ll get into this more with our next review, but one of the key points in this episode is that Sisko had to rush his plan without a large number of Starfleet ships that hadn’t yet arrived and without the Klingons (as noted). The creators amped up the drama unnecessarily, as even a fleet of, say, 1,000 ships would have been vastly outnumbered by the Dominion and would have had to take on the heavy-duty station defenses in the hands of Dukat. See above, and get ready for some deus ex machina.